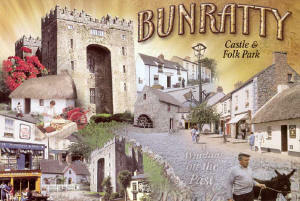 Bunratty (Bun Ráite) Castle and Folk Park is a popular tourist destination. 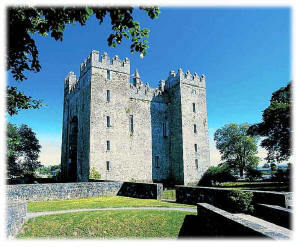 The earliest known history of the site was when the Vikings set up a trading post on the site in 950 and the first castle was built by a Norman in the 13th century. Its strategic position on the river Shannon made it the centre of many a battle, and it has it has been destroyed and re-built on at least eight occasions. Today we can enjoy the Castle built in 1425 by the MacNamara Clan. The style is called Irish tower house. Americans might be interested that Admiral Penn, father of William Penn, resided here for a short time. It fell into ruin, and in 1954 Lord Gort bought the castle and with the help of Bord Fáilte restored it to its present condition. The Folk Park, situated on 26 acres, is a living museum intended to show what village life was like in Ireland at the turn of the century. It contains farmhouses, cottages, and shops with great attention to authentic detail. The Park is a living museum: animals are tended, bread is baked, milk is churned, walls are whitewashed and roofs are thatched. You may visit an Irish farmhouse, watch the blacksmith fit a horseshoe, attend a weaving demonstration, and bake and eat scones at the local tea house. There are several options for eating and drinking within the Folk Park.